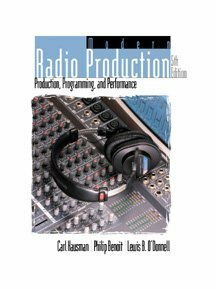 This work provides a current, comprehensive look at radio production and programming, integrating new material on cutting-edge technologies with explanation of traditional equipment and practices. Carl Hausman is the author of more than two dozen books, papers, and journals, many of which focus on metaphor theory and the philosophy of creativity. Some of his best known works include The Complete Small-Business Sourcebook (written with Wilbur Cross); Coping with Hearing Loss: A Guide for Adults and their Families; Crafting the News for Electronic Media: Writing, Reporting and Producing; and A Discourse on Novelty and Creation. Also the co-editor of the Journal of Speculative Philosophy, Carl Hausman has been an adjunct professor at the University of Louisville in Kentucky. Philip Benoit is an adjunct professor of English at Pennsylvania's Millersville University. He previously served as director of public affairs at Middlebury College in Vermont and associate vice president for communications at Franklin & Marshall College in Lancaster, Pa. With a broad background in radio, television, and public relations, Benoit was the first director of the broadcasting academic program at SUNY Oswego. He also served as executive officer of the American Forces Network in Europe and American advisor to the Vietnamese Armed Forces Radio Network. Lewis B. O'Donnell was Professor Emeritus of Communication Studies at SUNY Oswego. O'Donnell, a former president of a radio station ownership group, worked in a variety of management and performance positions in radio and television. He was awarded the Frank Stanton Fellowship by the International Radio and Television Society and he received the New York State Chancellor's Award for Excellence in Teaching.